Wondershare AllMyTube is a fast and easy YouTube downloader and YouTube converter to help you download any videos you desired from 100+ video sharing sites and put them to portable devices for watching. With a single click, you can download any videos playing on IE, Firefox or Chrome. Worry about the video compatiblity with portable devices? Why bother? 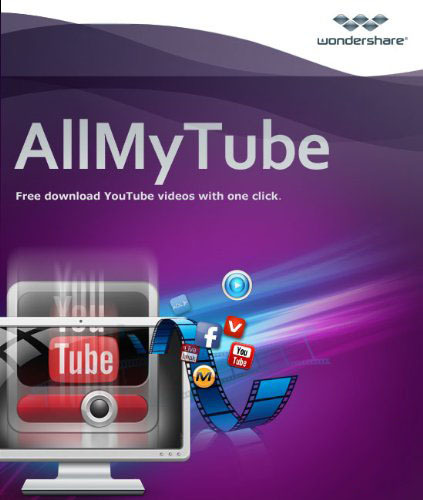 Wondershare AllMyTube converts and optimizes downloaded videos for almost all kinds of portable devices. VEVO, Facebook, Dailymotion, AOL, Metacafe, MegaVideo, Vimeo, Break. BlipTV, Veoh, VideoBash, LiveLeak, MyVideo, FunnyOrDie, Nico Video, etc. Download Button on the top of the video opened on IE, Firefox or Chrome. - Raw Recording: Record the video whilst it's streaming (i.e. Netflix, Hulu Plus) by launching the Video Recorder. options that fits you; Auto Shutdown, Enter - Sleep Mode or Exit Program. - Converts YouTube videos to popular video formats: Converts downloaded videos to MP4, AVI, MPG, MKV, WMV, M4V, MOV, ASF, DV, etc. It's the all-in-one YouTube video converter!